Atomic Ballroom’s Student Showcase was this weekend. Because gem’s loud and quick to yell when told that the loudest person wins tickets, she won tickets to the show. The theme was “Celebrate the Magic” featuring Disney music. It was pretty awesome! I particularly liked watching the shadows dance when these two were in the right position on stage. Besides this, I didn’t take many photos. The performers were really good. It was nice to see people of so many different levels dance. I’m sure it took a lot of guts for some of them to get up there. I really enjoyed pieces such as “Kiss the GIrl” from The Little Mermaid, featuring a shimmery, mermaid-tail-like dress, “Strangers Like Me” from Tarzan, “I’ll Make a Man Out of You” from Mulan, and “Friend Like Me” from Aladdin with an awesome dance (that suddenly made me really sad when I thought of Robin Williams and then the closing of Disney’s Aladdin – A Musical Spectacular. I just noticed while looking at the program that one of the dancers in that Aladdin piece, Jeff Glass, is a psychiatrist at the Long Beach VA. How cool! For all I know, he could have helped my father. Oh, and I have to add that there was an adorable little girl doing some of the transitions. One time she was a mermaid, one time she ran across the stage dressed as Indiana Jones and running from a “boulder,” and one time she was Rapunzel. After the showcase, there were complimentary refreshments. I ate too much, but the food was delicious. It was a lovely evening! This entry was posted in Art, Dance, Events, Food, Journal, Music, Photos and Screenshots, Shows and tagged aladdin, atomic ballroom, atomic ballroom student showcase, celebrate the magic, disney, friend like me, I'll make a man out of you, kiss the girl, mulan, shadows, strangers like me, tarzan, the little mermaid, toy story, you've got a friend in me on September 22, 2015 by TheUser. 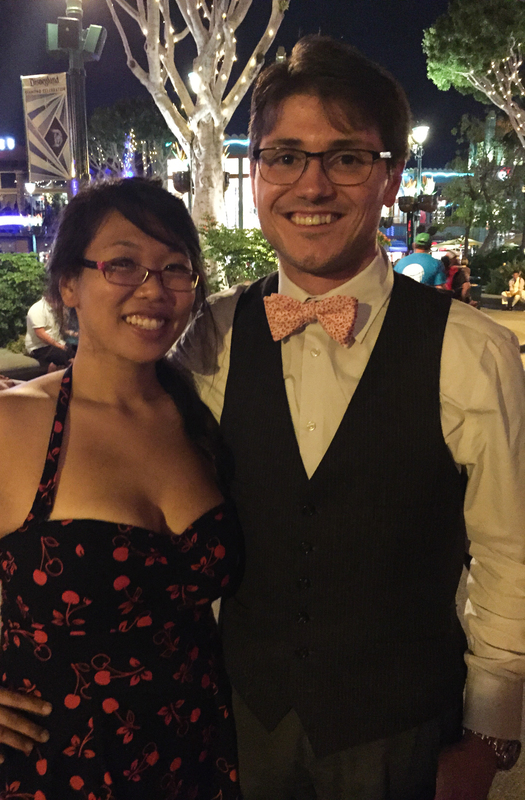 Dapper Day was here this weekend! I was the expo for about 15 minutes right before it closed due to traffic. Ugh! On the bright side, I won a free bow tie from xoelle through an Instragram repost contest and got to pick it up! There was some stress as I waited in line to see if we could get tickets to Folly, the after party, while gem spent a good hour trying to park. Luckily, we did get inside the party. Folly had drinks, a live swing band, a keyboardist and bassist in another room, and lots of dancing upstairs at Ralph Brennan’s Jazz Kitchen. gem captured me enjoying my White Russian. Maybe I’m getting ahead of myself, because I still wanted to share this photo of us in line. Here’s another shot of us while we waited in line. gem enjoyed the fireworks while wearing xoelle’s business card in her hair. We were hoping to meet some other friends there, but no one came. However, we made some new friends. It was an awesome night anyways with drinks, lots of dancing, and great music. Super fun! 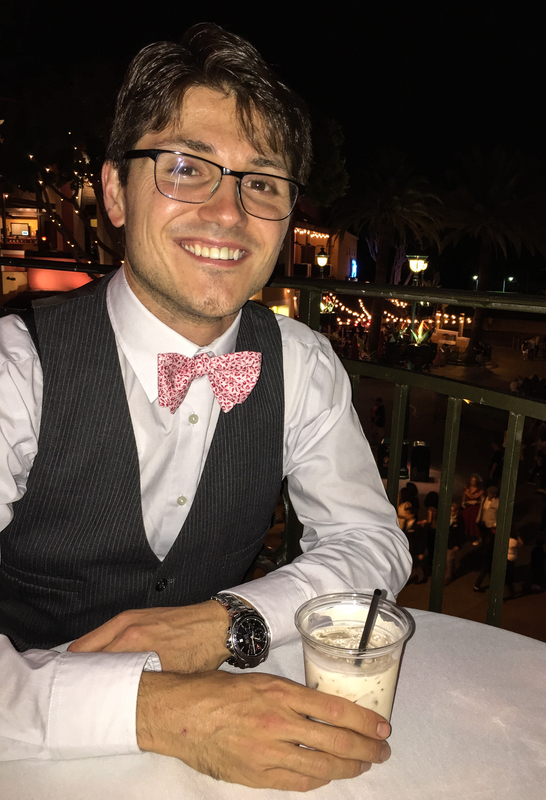 This entry was posted in Conventions, Dance, Events, Journal, Music, Photos and Screenshots and tagged dancing, dapper day, dapper day 2015, dapper day fall 2015, disney, downtown disney, folly, ralph brennan's jazz kitchen, xoelle on September 21, 2015 by TheUser. Is it time to go back to Cauldron Ice Cream yet? No? Oh well – hopefully soon. I went on the weekend, and it was really cool. This is the s’mores flavor in a puffle. The puffle is a waffle cone, but it’s definitely different than what you typically imagine for ice cream. It’s apparently “Hong Kong style,” but I don’t really know what that is exactly. I expected those bubbles to literally be bubbles filled with air, but they aren’t hollow at all. They’re pure, soft deliciousness, perfect to soak up the ice cream flavor. I’m sure it’s more carbs than a typical cone, but it was great. I actually had a dream about the puffle the night before I got to try it. It didn’t disappoint. The ice cream flavors were quite good and very interesting as well. Most of the ice creams came with toppings as well with balanced flavors combining beautifully. I ordered the s’mores ice cream. “Double chocolate ice cream layered with graham cracker. Topped with marshmallow fluff cream and then toasted for the full campfire experience.” S’mores are one of my favorite desserts, so I knew I had to try it. I love the incorporation of the graham cracker and marshmallow fluff cream. I wouldn’t expect to need the graham cracker given the similar puffle, but I appreciated the crunch (and of course the authenticity of the s’more). The marshmallow fluff cream was great; it wouldn’t have been a s’more without it. The H2O Rose was also quite impressive with its notable floral flavor. It truly tasted like roses. It looked the part as well in a beautiful pink and sprinkled with rose sugar. While I didn’t take a photo of it myself, Anela provided me her photograph! While I have a thing for chocolate, the H2O Rose might have been my favorite item as an artistic whole and my second favorite flavor I tasted. See how it’s arranged like an actual rose? I should try a new flavor next time I go, but I’m really tempted to order this. I tried more than that though. I was also impressed with the taste of the Vietnamese Coffee. Although the presentation wasn’t quite as special, it was my third favorite flavor. The Earl Grey Lavender was another floral flavor that was fun to pair with the Vietnamese Coffee. Rainbow Road was milk ice cream and Fruity Pebbles. I believe it was supposed to be topped with Fruity Pebbles as well, but they missed that in our order. While good, I think it was my least favorite flavor of the six I tried. On the plus side, it made me get a song about Rainbow Road stuck in my head. 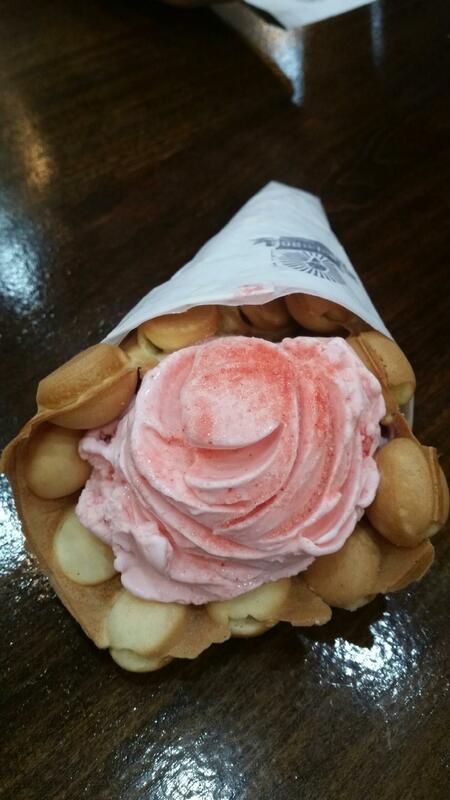 Lastly, I tried Strawberry Shortcake. It sounds like it should be unexciting, but I suppose classics are classic for a reason. This was one of the better strawberry ice creams I’ve had. Their menu lists “September 2015 flavors,” seemingly implying that the flavors change monthly. I don’t know if they all rotate or only some, but I’ll be interested to see what happens next month However, there’s more I want to try in September still such as the Sea Salted Caramel Crunch, featuring caramel ice cream and pretzel bits. There’s also the Cirque de la Crème: “Pieces of circus animal crackers mixed throughout, for a taste of nostalgia in every bite. Topped with rainbow sprinkles and a mystery animal cracker.” Doesn’t that sound adorable? As if they hadn’t already hooked me, they end the description with “a mystery animal cracker.” Yes, please! This entry was posted in Food, Journal, Photos and Screenshots and tagged cauldron ice cream, cereal, circus animals, coffee, dessert, fruity pebbles, ice cream, lavender, rose, s'mores on September 10, 2015 by TheUser.